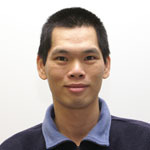 The FFIR-SINATRA Researcher Dr Albert Chen at the Centre for Water Systems (CWS), University of Exeter, has participated in FloodHack and won the First Winner Prize. 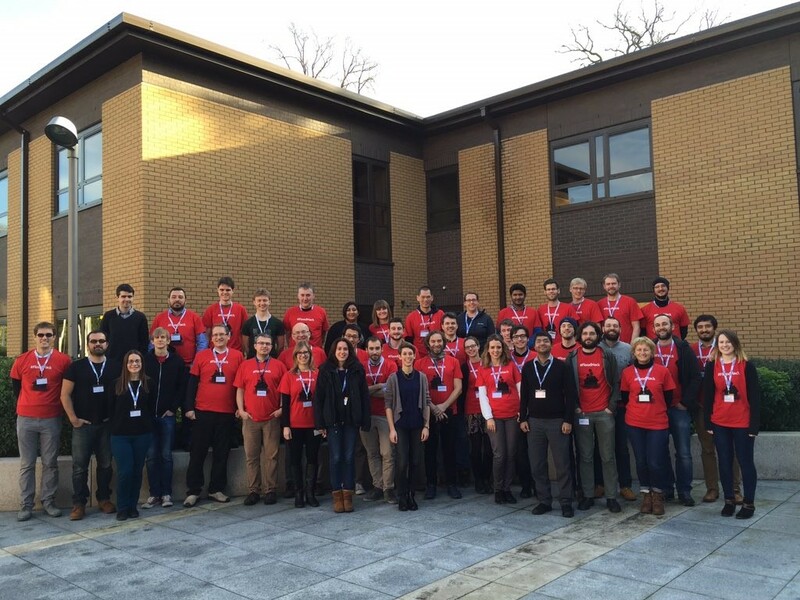 The FloodHack was a hackathon event on Global Flood Awareness System (GloFAS) held on 16 and 17 January 2016 at the European Centre for Medium-Range Weather Forecasts (ECMWF) in Reading, UK. It was organised by the ECMWF, supported by the Copernicus Emergency Management Service Program, to look for innovative solutions to overcome the existing challenges that GloFAS is facing. 40+ participants with a wide range of backgrounds (education, computer science, physics, hydrology, geography, etc.) 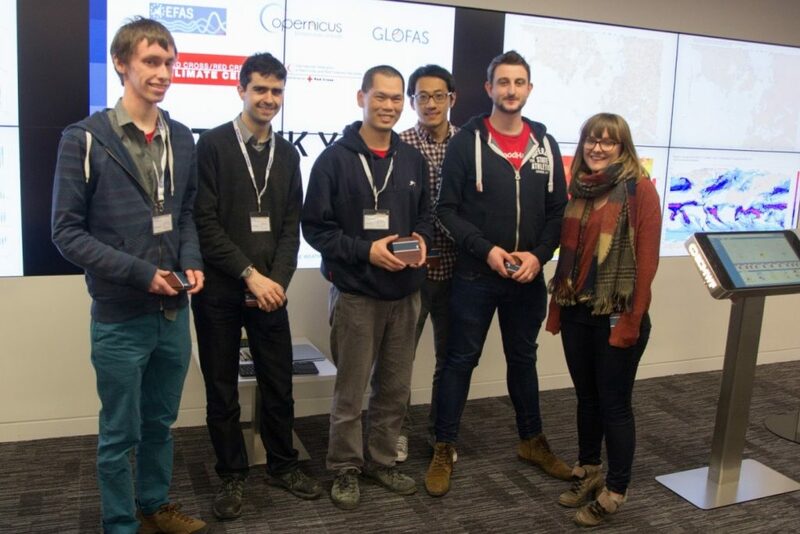 attended the FloodHack event and formed five teams to develop the solutions. Dr Chen teamed up with three Software Developers, Miss Laura Ludwinski, Mr Sam Griffiths and Mr Paul Barnard from JBA Consulting, the Physicist Dr Peter Watson from Oxford University, and the Hydrologist Dr Li-Pen Wang from KU Leuven. They developed the software LIVE (Logistic and Infrastructure Visual Evaluation) to summarise the detailed flood forecasting information from the GloFAS into a ‘Time to respond’ map that allows the decision makers having better understanding of available time to act for flood mitigation. The LIVE can also help prioritise the resources allocation so the areas with the most urgent flood threat will receive immediate attention. The objective and the workflow were determined in the first round of group discussion. Therefore, each member of the team LIVE contributed individual’s skills and knowledge to complete the subtasks, including information collection and extraction, data processing and analysis, and visualisation. Python scripts and the QGIS were the main tools the team LIVE adopted to develop the solution. After 27 hours of intense collaboration and countless cups of coffee and Redbull, a prototype of LIVE was completed. The outcome of each team was presented to all participants in the afternoon of the second day, and judged by a panel consisted of professional software developer, telecoms expert, environment and technology consultant, web technologist, and crisis manager. The judging criteria included (1) potential for innovation (2) relevance/usefulness (3) technical merit (4) design/user (5) experience/polish and (6) “wow” factor. FloodIT to offer refined flood information based on the GloFAS to help local users understand their situation. The (flooded) Italian Job that analysed big data to determine spatial varied flood warning thresholds for the GloFAS. LIVE provided “Time to respond” maps to help emergency management. Interception that adopted the GloFAS as an educational platform to raise flood awareness. GloFAQ to identify infrastructures based on the GloFAS that are at risk of flooding. The panel was impressed by team LIVE and their excellent application of the GloFAS data that can potentially benefit global stakeholders with different needs. The technology was also ready to make further applications achievable. 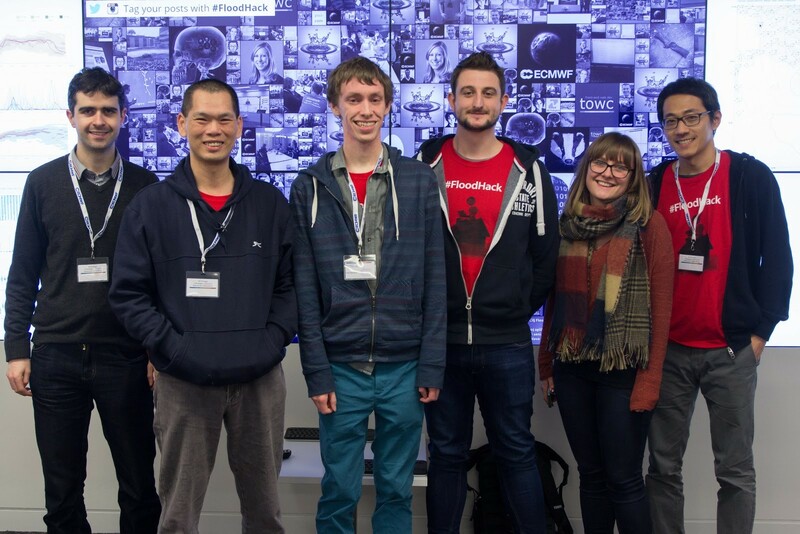 As a result, the team LIVE was announced as the First Winner of the FloodHack. Dr Chen thanks the talented teammates who successfully implemented the LIVE software. His knowledge gained from the FFIR-SINATRA project has been proven as valuable inputs to the team for developing the application. The FloodHack experience will also help the FFIR team to integrate the FRANC and SINATRA in the next stage of research. This entry was posted in Uncategorized on January 21, 2016 by Rob Thompson.